If you live in a metropolis, or even in a fairly large city, then you likely passed a dozen yoga studios, three meditation centers, and at least one sound bath pop-up on the way to work this morning. It’s 2018, and we all know what mindfulness is: a state of mind synonymous with awareness, acceptance and being present in the moment. In today’s world, that can be difficult to achieve. Mounting to-do lists and multiple devices can leave us multi-tasked, blurry-eyed, and too overburdened to even remember to be mindful. But that model doesn’t serve us. 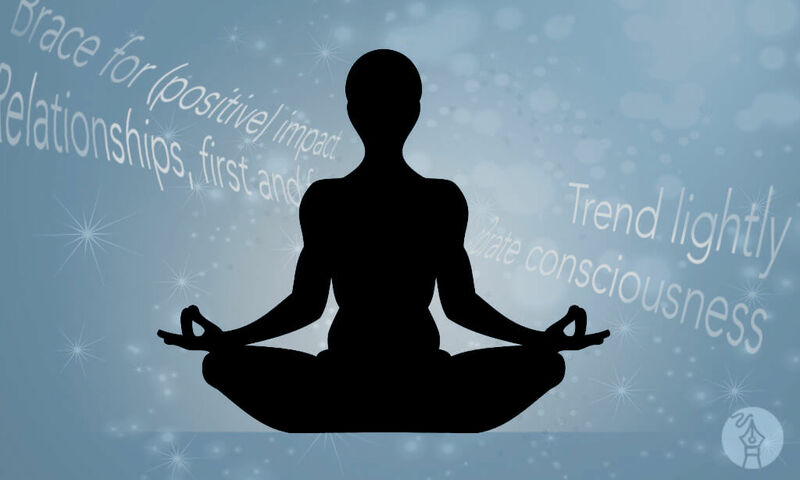 Global corporations like Google, Target and General Mills have been putting mindfulness to work for a decade now, proving that business is better all-around when employees are given ample opportunities for wellness. And now more than ever, consumers are proclaiming their loyalty to those brands that approach marketing with mindfulness, consciousness and authenticity. So, as we think about how to promote our businesses—and all of the ads and tear sheets and tweets that we’re going to release into the world—we should be mindful of a few things. Relationships, first and foremost. Consumers want to be courted. Millennials in particular are more interested in buying your brand as opposed to your product. Aggressive “push marketing” has been pushed aside in favor of more holistic, compassionate, consumer-minded tactics. What does that look like? It’s these methods—as opposed to a “fast and loud” sales approach—that can help you achieve lifelong relationships with your customers. Brace for (positive) impact. Your messaging—both what you say and how you say it—is pivotal to making a meaningful connection with your audience. So, when communicating about your product or service, be sure to spin it positive. Belittling your competition is never as effective as illustrating why your product is more powerful, more transformative, and more conscious of the consumer’s needs. Trend lightly. If you do feel like your marketing efforts are taxing but not necessarily rewarding, it may be because you’re trying to cover too much ground. Part of a Mindful Marketing approach is adopting specific, purposeful strategies with clear intentions. For instance, rather than jumping on every #hashtag and fleeting mini-trend, capitalize only on those that align with your company’s mission and goals. Corporate consciousness. Lululemon’s 2017 “Meditation OM the Move” campaign—converting a double decker bus into a meditation den on wheels and driving around London—was a stroke of marketing genius because it accomplished a number of things at once: Although the primary goal was to announce the launch of their new European flagship store, they also made 1-on-1 connections with future customers, associated their brand with wellness, and made a positive and purposeful impact on everyday people. Not every brand can go this “big” with their marketing campaigns, but it’s crucial that every strategy or campaign begin with consciousness—of your consumers, of your community, of diversity, of the environment, and of the world at large. Overall, as you craft and hone your marketing strategies, meditate on this: Be aware of the messages that you’re transmitting to the world. Every message you send—regardless of its size or platform or intention, be it an e-blast or Facebook ad—should always aim to be authentic, sensitive, and attentive to your audience. As its name suggests, when it comes to mindfulness, it really is the thought that counts.